The gold standard for introductory criminal justice texts. 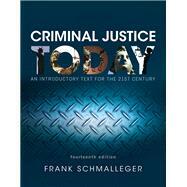 Best-selling and time-tested, Criminal Justice Today: An Introductory Text for the 21st Century,continues to lead the field as the gold-standard for introductory criminal justice texts. Its comprehensive coverage focuses on the crime picture in America and on the three traditional elements of the criminal justice system: police, courts, and corrections. Building upon the theme of individual freedom versus personal security, it challenges students to evaluate the strengths and weaknesses of the American justice system as it adapts to the needs of a complex and rapidly changing society. An instructor and student favorite, the Fourteenth Edition continues its tradition of thorough analysis of today’s issues in an easy-to-read format. Criminal Justice Today, 14/e is also available via REVEL™, an interactive learning environment that enables students to read, practice, and study in one continuous experience. Learn more. Chapter 1: What Is Criminal Justice?